Dot and I have watched different variations of the Elves and the Shoemaker at different occasions. And I’m always impressed with the skillful hands that made the leather shoes – be it the elves or the shoemaker. One day, I thought I could try to make a pair of sandals for Dot from the un-used cardboard in our house. I started by measuring and outlining her feet on a cardboard and cutting out the soles of her cardboard slippers. I then slipped in the strings into the holes, measured to make sure the length of the string was just right and attached a rubberband at the end of the string. 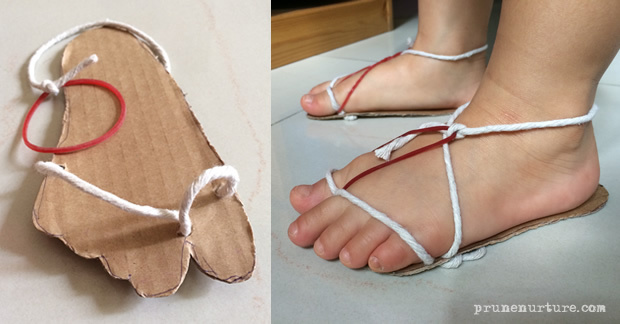 Voilà, in less than 30 minutes, I made a pair of bespoke cardboard sandals fit for my little girl. I helped her to put on her sandals. She strutted and pranced around the house with her new sandals and then went on with her usual play and activities. 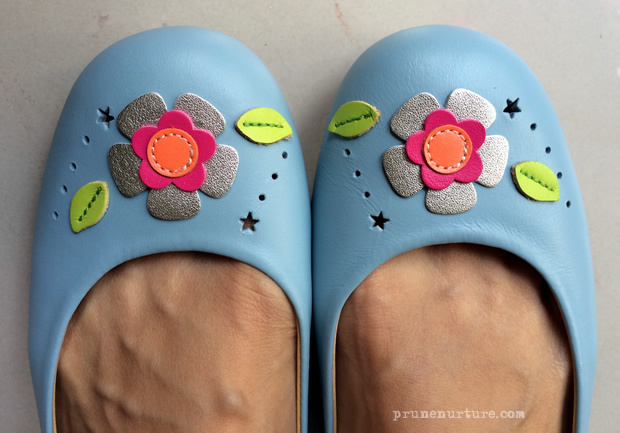 About a week after I posted our cardboard sandals on my Instagram, I was pleasantly surprised to see our Instagram post (@prunenurture) being picked up and reposted @thesingaporewomensweekly. The traditional way of shoemaking ,where the shoes are individually handmade with extra attention and careful detail, is almost a lost art now, as bespoke shoemaking is largely taken over by machines, commercialized and mass-produced. Dot and I are blessed to have our first pairs of award-winning luxurious bespoke be*U shoes. They are made with 100% finest quality leather from Europe and America. These colourful and fun handmade footwear are specially designed and crafted by well-trained shoe artisans under the guidance of be*U founder and chief designer, Professor Hsu. be*U only uses 100% genuine leather as it is a breathable material. It helps to keep the feet cooler and dryer. It also prevents blisters, discomfort and odour. 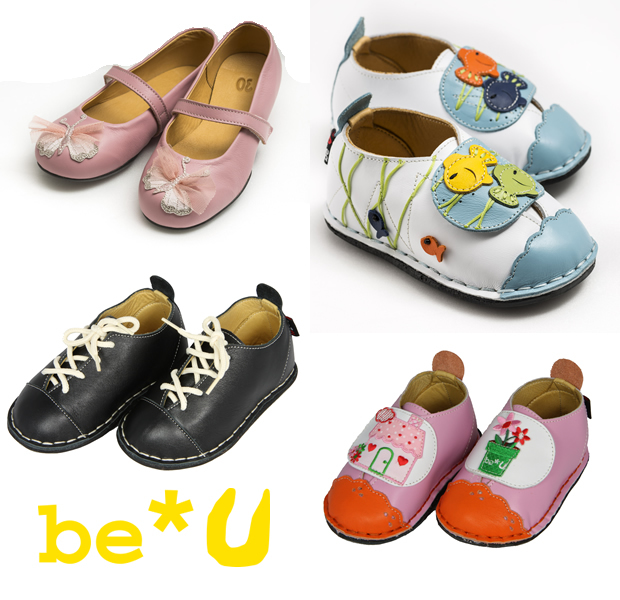 At be*U, the customers can choose from a range of 600 motifs and 100 colours to design and create their own personal pair of shoes. Classic stitch is used as it does not unravel. To add to its bespoke service, the customer can even personalize the shoes by adding names. Each pair of shoes takes a minimum of 10 man-hours to produce with a four-to six week delivery time. The happiest person is none other than Dot. 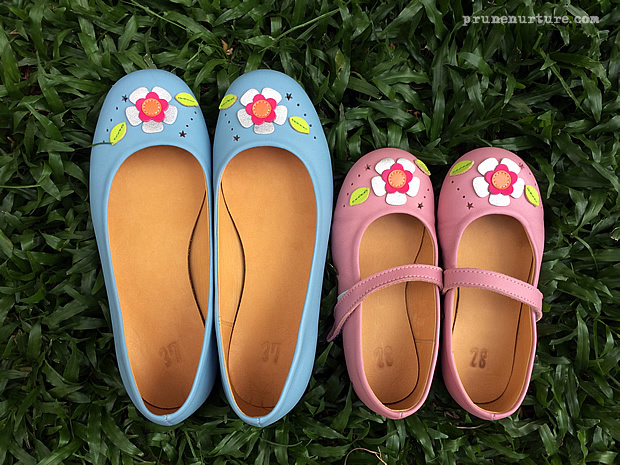 The moment she set her eyes on her pair of pink shoes from the ballerina collection, she fell in love with them. She keeps wearing them around the house, refusing to take them off even when she is asked to remove them. She did this for a few days until her dad kept the shoes out of her sight. When I first put on my first bespoke leather shoes from Be*U, my immediate response was “Wow! It’s really comfortable and soft!” Though it is a little loose for me as my feet are a little bony, I’m happy with the shoes. Do the soles of your shoes fall off after some time? Does the skin of the faux leather crumble and peel off when the shoes are kept for more than a year? These are the common problems I have with mass-produced non-leather shoes. 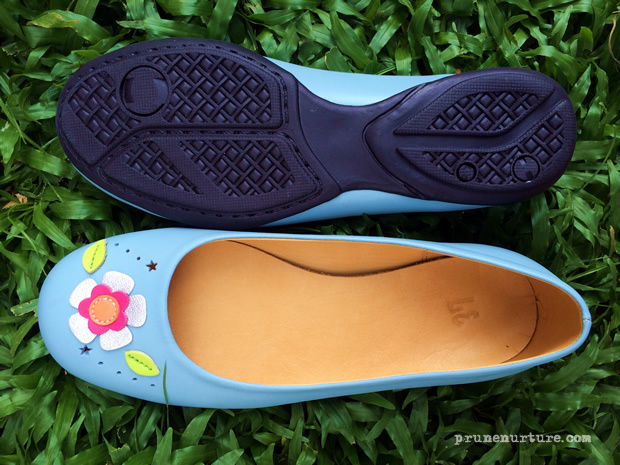 What I like about handmade shoes is that usually they are very durable. I had a pair of leather boots I bought more than 10 years ago, though not customized, is still in very good condition and I’m wearing them for my winter trip to Australia. The durability of a pair of shoes depends largely on how the shoes are being made. As I’m not able to wait that long to test and review the durability of be*U shoes, how be*U shoes are being made would be a good indication of its durability. You can definitely check with me a few years later whether my be*U shoes are still in good condition. You can get 20% discount off when you quote my blog name (Prunenurture) when you make online purchase (not at the retail shops). To place the order, you can email to order@beushoes.com or private message at be*U shoes’ facebook. Remember to like be*U shoes’ facebook and/or follow be*U shoes’ instagram to enjoy the discount and to be updated with the latest products and news. Keyboard collection and Ballerina collection are now available online, at Takashimaya department store and TweenAge in Singapore . View more designs at be*U Facebook or Instagram. Disclaimer: Prunenurture received two pairs of be*U shoes for product review. No monetary compensation is received. Previous postTraining a risk-taker Next postDay 1 : Sydney, here we come! Hi Dee, I wish I had found your blog earlier! By most brands, my left-right feet differs by 1 size so it has never been possible for me to wear shoes that require perfect fitting e.g. high heels. I need to give be*U a call. Hopefully they are affordable. Hee….